In this cartridge comparison, we are going to take a look two cartridges, the 7mm-08 Rem and the .270 Win. Both of these cartridges became popular in the shooting world because of their ballistic characteristics, especially the trajectory, and the low recoil while still can bring down medium and even larger sized game. Given the purpose of these two cartridges and that they are often utilized for the same shooting applications, you will often find them the topic of debate for which should be used. In this article, we will take an in-depth look at how the ballistic and other performance characteristics of these two cartridges stack up to each. And as with all of our other cartridge comparisons, we are more interested in teasing apart the differences and similarities, not to try and label one cartridge as better than the other, but to better understand conditions and situations where one cartridge might be better suited than the other. The 7mm-08 Remington was introduced in the 1980’s as a way to replicate the performance of the older 7×57 Mauser in a modern caliber and cartridge. The 7mm-08 was derived from necking down the .308 Win cartridge which allowed it to accept the smaller diameter (0.284inch) 7mm bullet. At the time of its arrival, the popularity of 7mm bullets was growing exponentially because of its ballistic performance and the lighter recoil compared to other larger hunting cartridges, particularly some of the more common .30 cal options. Part of the reason for the better ballistic properties, such as the trajectory and wind resistance, is due to the more slender, aerodynamic shape of the .248” caliber bullet. The 7mm-08 provides an excellent hunting cartridge for medium to large game. It was intended to provide lighter recoil while maintaining heavy enough bullet weight and velocity to effectively reach out and kill game efficiently. While the 7mm-08 has a loyal group of users, its popularity is not at the same level of other hunting cartridges. Even so, it has a variety of bullet weights, mostly within the 120-150 grain weight although there are heavier rounds available that are closer to the common hunting rounds of its parent casing. The .270 Winchester/.270 Win/.270 made its appearance in the hunting world in 1925 where it would stay in relative obscurity for a time. For several years, the .270 did not have a significant following of users. Jack O’Connor, a famous writer of firearms and hunting, really pushed this cartridge and its abilities in the field and brought it to the forefront of hunting by enlightening readers with his own exploits and experiences with the cartridge. It remains a very popular cartridge to this day. The .270 has gained a huge following in the world of hunting from small varmints and predators to large American game such as sheep and deer. With a leap in bullet technology, the .270 is much better suited for taking larger game such as elk. The .270 came from the .30-03 which saw very brief use in the United States in the early 1900’s. Another cartridge that comes from this parent case is the .30-06 which are very similar to the .270. The .270 can be thought of as a necked down version of the .30-06. As far as bullet weights go with the .270, most ammunition is going to fall between 120-160gr. There are smaller weights that are available for small game. Like the .308, there is a lot of options regarding bullet weight and design, and they are readily available and affordable. Like the 7mm-08, the .270 is often chosen because of its ability to shoot flat at distances and still maintain the proper terminal ballistics to reliably take down medium to even large size game. Before we jump into the different performance characteristics of these two cartridges, let’s step back and compare the specifications of these two cartridges. Just from this knowledge, we can begin to tell where some differences in performance might pop up and it will also make the results of the proceeding sections make more sense. There are some similarities in the bullet case dimensions between these two cartridges. The 7mm-08 bullet diameter is only about 7 one-thousandths of an inch wider in diameter with the same difference in the neck diameters, which makes sense. We also see that the two cartridges have the same base diameter, though the .270 Win case is much longer than the 7mm-08 case even though they share the base diameter. The bullet of the .270 also does not sit down in the casing enough to reduce the cartridge space so with a case length of half an inch longer, and the same difference in overall cartridge length, it can hold more propellant. It is also rated to handle 5,000 more psi of pressure than the 7mm-08 cartridge. Now, cartridges are not loaded with the maximum amount of powder charge, especially from the manufacturer. But, this often means that they can load the cartridge with more capacity with more propellant than the smaller casing. With these differences in cartridge specifications along with using similar bullet weights, we can already begin to assume that there are going to be some differences in the performances of these two rounds. So to compare these two cartridges, we have gathered ballistic data from the manufacturer of the individual rounds as well as generated our data using online ballistics calculators. We have selected five individual rounds for each cartridge type. In our selection criteria, we wanted to use popular rounds that see a lot of use in the field, both hunting and target and rounds that cover a good selection of bullet weights and types. It is quite possible that as you look at our rounds, you might not see your favorite round listed. It’s no slight on our part. We are limited in space, and ten rounds seemed like a nice round number. We would love to look at a couple dozen for each, but with our selection process, we think the results can be extrapolated to other rounds. To give an even wider look at how these two cartridges compare, we have compiled the data for an additional fifteen rounds for each cartridge and will list the averages for these rounds at the end of each performance category that we will examine. With the ten we will look at, this brings us up to twenty rounds for each cartridge. While all of these rounds will not be graphed and discussed, the averages will back up that our selected rounds still give an accurate reading of how the two cartridges are similar and different from each other. We will present this data in several sections and then present all of it again in the applications section. By doing this, we will be sure that any trends that we see throughout the article with the smaller selection of rounds is giving us an accurate representation of the entire field. We have listed the ten rounds we will be using throughout this article below. All of the selected rounds are factory loads that are readily available to us consumers. After looking at this data, you might remember coming across forums or blogs where someone is showing much higher velocities or other performance specs for these cartridges, and they are more than likely hand loaded. Factory loads tend to err on the side of caution when it comes to loading the casings with powder for safety reasons. You are not going to find factory loads with max charges though there is match ammo out there that generally come a little hotter. We also want to note that all of the data here is computer generated. The majority of the data is available from the manufacturer, and where that was not available, we relied on ballistic calculators from trusted sources. Where ballistic calculators are used we kept as many variables the same between rounds of the same cartridge and did not take into account weather variables. Where calculations are made, we will be sure to make clear our variables to keep you in the loop. This might include zero range, gun weight, powder charge, etc. When it comes to this type of data, there is no concern with comparing cartridges, but you should be aware that these numbers can change when being fired from your rifle. Each rifle tends to have its own profile, and this means some small differences in ballistic output. As far as comparing the two cartridges, computer-generated data has its advantages in that these small differences are negated, and we can keep all of the outside variables controlled. Remember, we are not looking at what’s the best round. As we stated earlier, each gun can have a particular brand that seems to work better for it. We are taking a broader approach, and computer-generated data gives us the most uniform data sets for comparing two cartridges. With all of that out of the way, let’s look at our first performance category. A lot of readers are probably as concerned with the differences in recoil between two cartridges as anything else, especially if you have never had much experience with high-powered centerfire rifles. For more experienced shooters, the difference in recoil might not be as large a concern unless it is a dramatic difference. For most centerfire rifles used for the same game or competitions, as these two rifles often are, the differences in recoil is not going to be very noticeable. Even so, recoil is a topic to think about as it can influence shot placement. Whether it is while trying to line up the crosshairs on a trophy buck when the adrenaline is pumping, or it can increase fatigue from a day on the range and make those last few shots seem to miss by a few centimeters. What we are going to look at is the actual energy that is generated from firing these rounds. It’s not quite the same as the actual felt recoil that you feel, but increased recoil energy does correlate with increased felt recoil. A lot of other factors go into felt recoil, including gun design, so it’s not very quantifiable. To calculate the recoil energy, we used the bullet weight, muzzle velocity, propellant load, and gun weight. So obviously, the actual numbers might change based on your rifle weight, but the difference between the numbers should remain the same since we kept the gun weight constant for each round at 7lbs. The amount of powder used by the manufacturers was not available, so we used load data from Nosler to determine a conservative powder charge for each cartridge. We kept this powder charge constant for each round of their respective cartridge type. 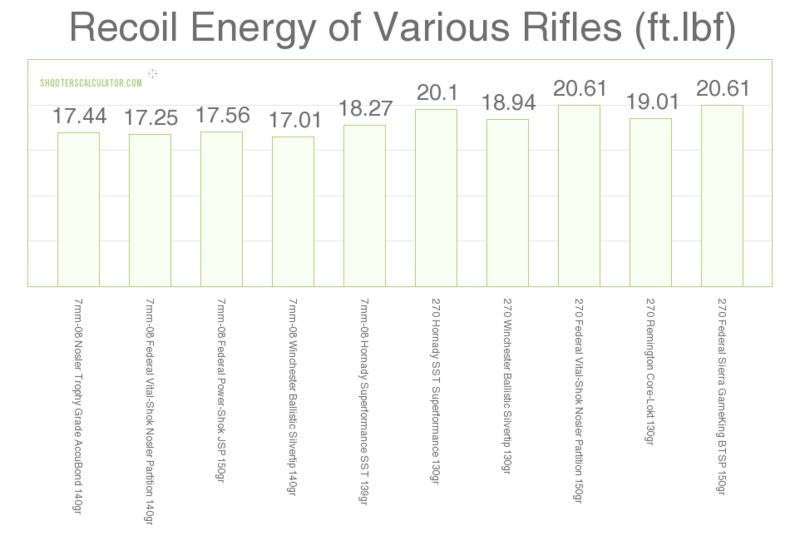 So, let’s take a look at the ten selected rounds and see how the recoil energy stacks up to each other (Graph1). From first look, we can see that the .270 Win rounds all show slightly more recoil energy than the 7mm-08 rounds. Even with a few more ft.lbs of recoil on some of the rounds, all ten fall below the 21ft.lb mark with our set variables. As we have stated several times, these numbers can fluctuate given your shooting platform, and they might vary depending on the powder type and amount the manufacturers are using. But, we are more interested in the differences between cartridge types rather than individual rounds, so that small fluctuation isn’t going to be something we will get too concerned about. A sort of guideline that you will often come across when it comes to recoil affecting shooting is anything above 20ft.lb can impact a shot. Of course, it’s just a guideline and it just depends on who is holding the rifle. If we do look at these two cartridges, the 7mm-08 rounds all fall below the 20ft.lb mark but the .270 rounds are not too far off. Unless you are very in tune and experienced shooting these two rounds, you probably are not going to feel much of a difference. Of course, most of us will put up with a sore shoulder if the cartridge excels in other categories. So with recoil in mind, let’s take a look at several ballistic characteristics of the 7mm-08 vs .270. For a more extensive look at more rounds, here are the averages for all forty rounds that we have compiled. As you can see, the trend is very similar to what we saw above. Here again, we see a slight increase in recoil energy generated by the .270 Win when compared to the 7mm-08 Remington. The difference is slightly less than2ft.lb and we are not the ones to say whether or not this type of difference is enough to sway your decision in anyway. Both averages fall below the 20ft.lb mark which we discussed the significance of that marker earlier. If you look at the individual rounds for both cartridges, you will find the rounds that produce the most recoil are .270 Win rounds where several of them broke the 20ft.lb mark, though there are some 7mm-08 rounds that come close. With the averages so close for these two cartridges, you would expect a lot of overlap between the individual rounds. Really, there is not a whole lot of deviation from the average for either and you see the majority of the 7mm-08 rounds stick around the 17ft.lb mark and the majority of the .270 Win rounds hang out around the 19ft.lb mark. In this next section, we are going to take a look at several categories that all fall under the ballistic specs. We will look at the bullet velocity and trajectories over a range and then also examine the ballistic coefficients of these rounds. This is a key section when it comes to determining which situations each cartridge might be better suited for than the other. It is important to note that though we are looking at all of these categories individually, we don’t think a decision should be made based one single category. All of these different specs, including the categories outside of ballistics, all go hand in hand and influence each other. With that, we will try to bring all of this information together when we get to the application section. We just think that it is important to consider if you are deciding between two cartridges to not focus on one individual performance specs as the basis of your decision. We hope that articles such as this one help you take a broader look at how two cartridges compare to one another. 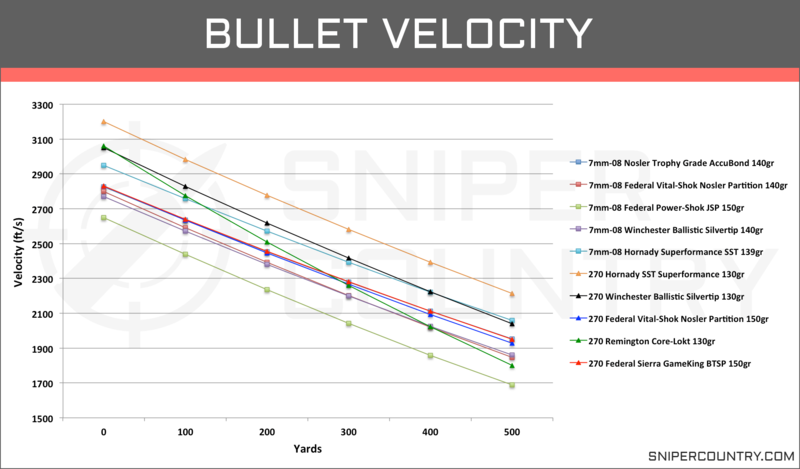 The velocity of the bullet plays a critical role in just about every ballistic and other performance categories we will look at. Not only for other ballistic properties but also in terminal performance on impact. You will often find a lot of people fixated on the velocity of the bullet, and while velocity is important, they often lose sight of why it is. It’s not just about the speed of the bullet. As we said, it’s how that speed effects other components of a bullets flight and reaction on impact. There is a fine line with the velocity of the bullet. Too little and you might not get the penetration or expansion you need. Too much velocity with an incorrect twist rate or a certain bullet design and you can get an unstable flight which leads to inaccuracy. The velocity is also important because the quicker a bullet can reach the target, it minimizes the amount of time outside influences have to alter its path and stability. The vast majority of centerfire cartridges are going be at supersonic speeds when leaving the muzzle and maintain that speed for at least several hundred yards. And yes, we know there are some subsonic rounds, but they are not near as numerous nor relevant for this particular comparison. Bullets at supersonic speed, when stabilized leaving the barrel tend to have a much more stable flight and are more predictable than once they fall below that speed. So again, the velocity and the amount of time the bullets stay at higher velocities is often a quality of concern for long range marksmen. We gathered the velocity data for each of the ten rounds we have selected from the manufacturer’s website which were generated using a 24″ test barrel. So, these numbers might change a bit given the length of your rifle’s barrel, but that change should be similar to any round you put through the weapon of that same cartridge and caliber. The graph below (Graph 2) shows the velocities of the ten rounds from the muzzle out to 500 yards. If we just look at the averages, we see that from the muzzle out to 500 yards, the .270 Win round carries about 200 more fps than the 7mm-08 rounds. We would expect this given the increased recoil, and increased case capacity of the .270 cartridge probably means they have a greater amount of propellant than the 7mm-08 rounds. And with similar bullet weights, it’s going to mean increased velocity. While averages give the advantage in bullet velocity to the .270, we do see rounds from each cartridge type interspersed in the graph. We see the 139gr Hornady SST 7mm-08 cartridge performs nearly as well as the two fastest .270 rounds and better than some of the other ones. We also have a .270 round that has the slowest velocity besides one 7mm-08 round. We also want to note that the velocity data is also important for hunters who want a certain amount of penetration and expansion. For penetration, we will discuss in a later section, but the manufacturer should have the needed information on bullet expansion and velocity level so you can know how well each bullet will expand at certain ranges. Velocity is also important for stopping power as it is a component of the amount of kinetic energy that is carried by the round as well as the momentum. So while on average the .270 cartridge is going to give you a few hundred more fps of velocity, there are better performing rounds of each cartridge type, and we will need to take into account more performance specs to make the picture more clear. Below are the averages for all forty rounds that we compiled for this article. As you can see, even with the increase in sample size, the general trend we saw with the previous rounds remains the same. The same can be said for the individual rounds of each cartridge as well. While there are quite a few more .270 Win rounds that break the 3000fps mark, there are several 7mm-08 rounds that are in that area. If you are strictly looking for the highest velocity, the .270 Win is going to offer you more options for factory loads on the high end of the velocity spectrum. Related to velocity is the supersonic limit that these cartridges can provide. In this comparison, we are looking at the average yard marker where these cartridges fall below the supersonic threshold. Many long-distance marksmen pay attention to this metric because bullets tend to remain in a more stable state when at this speed when compared to their flight once they fall to subsonic speeds. With more stability, it is a little bit easier to calculate your shot at 600+ yards. 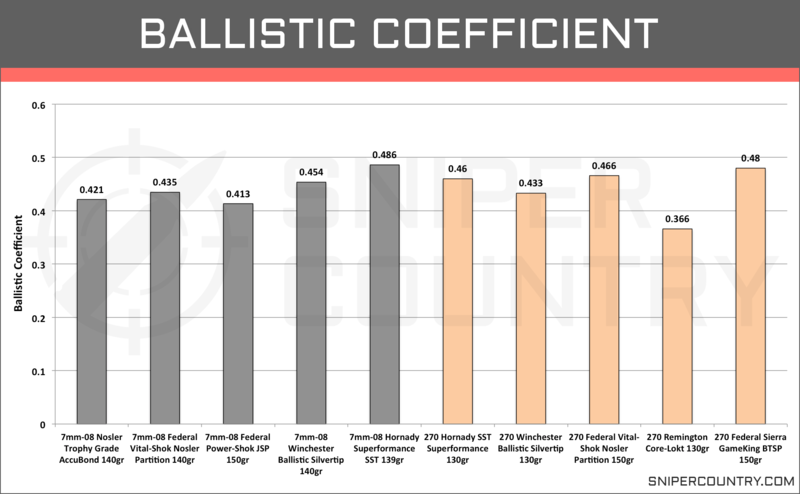 Factory loads are probably not sought after by very many people for the distance where this metric comes into play, but it is interesting to compare and some of you might be toying around with the idea of trying them out. Below, you will find the average distance where these cartridges fall below the supersonic threshold. There is only 65 yards difference between the averages of these two cartridges and both still have averages that break the 1,000-yard mark. If you look at the individual rounds, there is quite a bit of overlap between the rounds of each cartridge though the .270 does tend to have more rounds that remain supersonic at 1200+ yards. The 7mm-08 Remington is more limited in round options at this range. Of course, there are a lot more rounds available but generally, the construction of the .270 Win allows for longer supersonic flight. Is it enough of a difference to make you lean towards one cartridge? We can’t answer that but we do know that every round for both cartridges remained supersonic past 800 yards. Other ballistic categories might decide if this difference between the two cartridges should carry more weight. The ballistic coefficient (BC) is either a term you pay a lot of attention to or it’s something you have never given a moment’s thought. 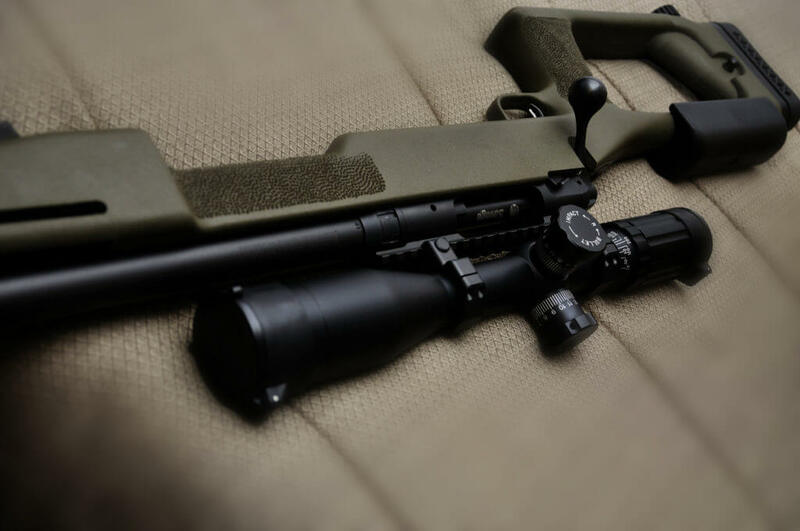 More often, the BC plays a bigger role in selection for long-range target shooting and some hunting scenarios where 400-500-yard shots are the norm. We have always noticed that a lot more long-range marksman pay attention to the rounds ballistic coefficient when compared to those who relegate most of their shooting to hunting applications. Naturally, the longer the shots, the more wind and other environmental factors will have an impact on the flight of the bullet which is why more weight is given to the BC. But even for a 250 to 300-yard shot, the ballistic coefficient should be weighed and measured. Look at any ballistic calculator and input those ranges and normal conditions you encounter when hunting and you will see that there is bullet drift. Play around with the BC and you will find that you can shave off a couple inches. I don’t know of any hunter who doesn’t want to increase their chances of putting a round on the mark. The ballistic coefficient of a round is simply letting you know how well the bullet resists drag and wind drift and thus, the easier it will be to group shots at long range. The larger the coefficient, the better the bullet is at resisting these external factors. BCs could also have several articles written on the variables that go into its calculation, but for now, we will stick with the basics. We do recommend digging into the BC and how it is derived. It’s beyond us to try and describe it, but if you’re reading this article, it will interest you. We have compiled all of the BCs for the ten rounds we are comparing and listed them in the bar graph below (Graph 3). What should jump out to you is that both of these cartridges feature bullets that have excellent ballistic coefficients. Especially for rounds used for hunting purposes. Sure, there are going to be rounds out there for other cartridge types that might have more BCs in the .5-.6 range, but these are not too shabby. If we look at the averages of these rounds for each cartridge, there are almost exactly identical. In fact, the average BC of the 7mm-08 is .4418 while the average BC of the .270 Win rounds are .441. Of course, the bullet type and design are big factors in the BC of the bullet, more so than the actual cartridge type. Both of these cartridges can be fitted with similar weight bullets, and both have slender profiles and similar velocities. All are factors in determining the BC, and it comes out to rounds for both that have similar numbers. There are several rounds of both cartridges that have BC’s above the .45 mark and also rounds for each cartridge at above the .48 mark. Depending on your hunting or shooting situation, there are going to be rounds available for both cartridges that will give you the wind resistance that you need. Let’s take a look at the average BCs when we incorporate out larger set of rounds. We also want to take the time and note that we are aware that the average BC is useless if you’re looking for an actual round to chamber. You’re not shooting averages out there. At this point, we are just looking to see if there are any trends and general differences between the cartridges. That’s about as similar as you can get. Just like the smaller sample set in the bar graph, these two cartridges have very similar averages for the ballistic coefficient. If you look at all of the BCs for the individual rounds (not shown), you will see that both cartridges have rounds within the same range spanning from the lower 0.3 range up to the high 0.4 mark. The trajectory is one of the most discussed ballistic properties when it comes to discussing the performance between different rounds as well as between two different cartridges. This is especially true for cartridges popular among long-range marksmen and hunters. When we talk about trajectory, we are only referring to how much a bullet will drop as it moves downrange. A bullet’s flight path has a characteristic arc with the bullet dropping in elevation over time. A lot goes into a bullet’s trajectory including bullet specs as well as environmental characteristics. The velocity and BC both affect the trajectory of the bullet as does gravity and wind resistance. Most hunters/marksmen want a flat shooting round. And by flat we mean there is a less pronounced drop in elevation over time. This flatter trajectory makes it easier to adjust for shots over longer ranges and in theory, should make accuracy and precision more attainable. We are going to take a look at both the short and long-range trajectories of these two cartridge types. Before we do, we want to step back and take a look at the trajectories of these two cartridges. It can get a little cluttered when we start looking at ten different rounds in one graph, and we are also looking at a wide range of weights and bullet types. In the following graph (Graph 4) we are only going to look at two rounds, one from each cartridge type. We have selected rounds for each cartridge that are made from the same manufacturer, have similar bullet weights, and have similar ballistic coefficients. With this, it gives a good representation of how these trajectories compare between the two cartridge types. Both of these cartridges have pretty flat trajectories with less than 20 inches of bullet drop out to 350 yards. There is no noticeable difference between the two rounds until you get out to the 200-yard mark. From there we start to see the .270 show a flatter trajectory than the 7mm-08 round. The difference still is not too drastic with a 10-inch difference between the two at the 500-yard mark. We should note that the 7mm-08 round is slightly heavier than the .270 Win round. The difference in trajectory might shrink with a lighter 7mm-08 bullet. Let’s take a look at some more rounds and see if we see this similar trend. When comparing two cartridges that are often used in the hunting world, we like to look at short range trajectories with the optics sited in at 100 yards. We like to look at the trajectory at these ranges because it is most often the distance hunters in most applications sight in their optics. We will take a look at the long-range trajectories shortly. We gathered the short range trajectory data from the manufacturers when available and generated the bullet drop from an online ballistics calculator when the manufacturer data was not available. 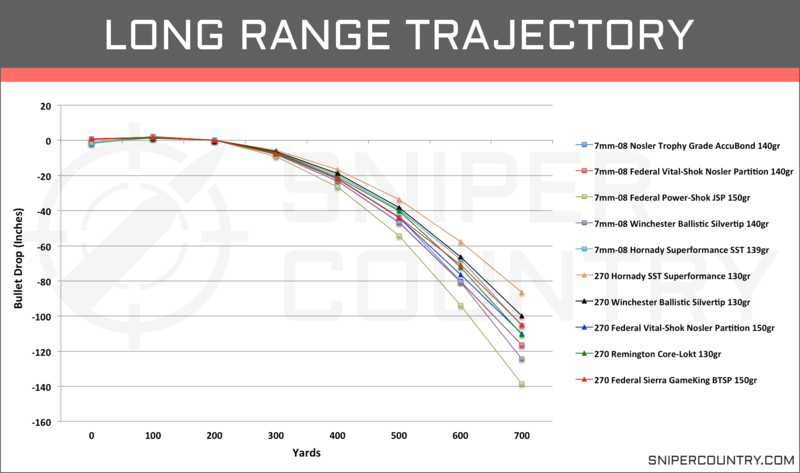 The data shows the bullet drop in inches from 50 yards out to 300 yards with the rifles zeroed in at 100 yards (Graph 5). The data was also generated using a 24” test barrel. At the 50 yard mark, there is no difference in the trajectory of the two rounds. At 200 yards, all of the rounds are still clustering pretty tightly, but we do see the rounds from both cartridge types begin to cluster with each other with the .270 Win rounds having a slightly less pronounced bullet drop. And we do mean slightly. The averages for these two cartridge types at the 200-yard mark have the .270 Win rounds showing less than 1 inch of bullet drop than the 7mm-08 rounds at 2.8″ while the 7mm-08 rounds show 3.58″ of drop. The gap only widens slightly as the rounds move out to the 300-yard mark with the .270 Win rounds showing an average bullet drop of 11.16 inches and the 7mm-08 Rem rounds showing 13.3 inches of bullet drop. We do see the rounds for each cartridge group together for the most part, though like the velocity, there are rounds for each cartridge that give you better performance regarding trajectory though the three steepest dropping rounds are 7mm-08 rounds. In the table below, we have listed the averages of the forty rounds we compiled and their short range trajectory numbers. Again, even with more cartridges in play, we see the same trend pop up between these two cartridges. Again, there is not any real difference between the two cartridges up to 300 yards. At the 300-yard mark, we see the .270 Win having right at 2 inches less bullet drop than the 7mm-08 and the difference increase by a little over an inch at the 400 yard mark. Overall, the cartridges of concern for this article are very similar in their trajectory at short ranges. The top performing rounds from this selection are .270 Win rounds, but there are quite a few 7mm-08 rounds with only 25 to 28 inches of bullet drop at 400 yards. When looking at the individual rounds, there is a lot of overlap and they tend to take up the same range. One of the major reasons these cartridges came about and what drew people to their use was that they could provide a flat trajectory without the increased recoil and without sacrificing knock down power at longer ranges. These rounds also have the potential for more extreme distance shooting and is why we want to compare the two cartridges at distances of 500+ yards. We gathered data and used ballistic calculators to generated this data. The “rifles” were sighted in at 200 yards and data points generated from the muzzle out to 700 yards (Graph 6). 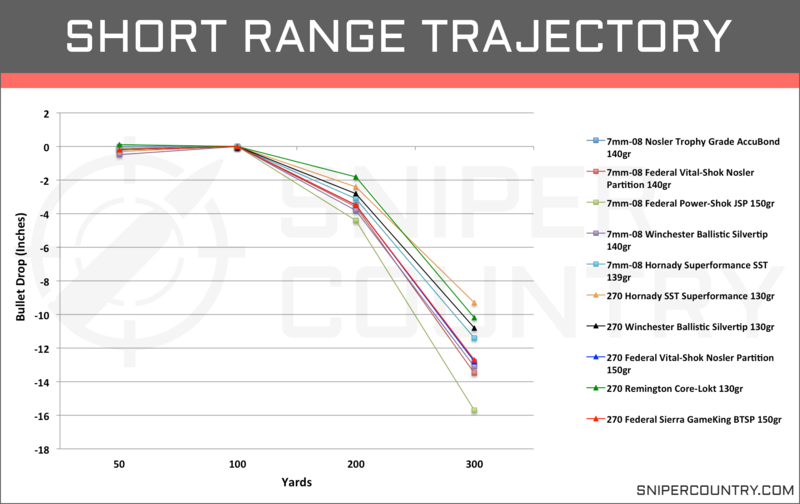 Like the short range trajectory, we see a lot of the same trends between the two cartridges in the long range trajectory. We see the both cartridge’s rounds group more tightly together, though there is a little overlap, with the .270 Win rounds showing a less pronounced bullet drop than the selected 7mm-08 rounds. Out to 400 yards, there is no difference between these two cartridges. There is less than two inches of difference between the averages for these two cartridge types with the .270 Win having a slight advantage. As the cartridges move out to the 500, 600, and 700-yard range, the difference between the averages continue to increase with 18 inches of difference between the .270 and 7mm-08 rounds. Again, there are several 7mm-08 rounds that have nearly as flat or flatter trajectory than some of the .270 rounds, but we see the majority of the .270 Win rounds provide a flatter trajectory. In the table below, we have listed the averages of the forty rounds we compiled and their long range trajectory numbers. We have also included a 1,000 yard marker for those who like to test the limits. Like the previous graph showing the trajectory of our ten selected rounds, we still see that the .270 Win has a slightly flatter trajectory throughout the range. 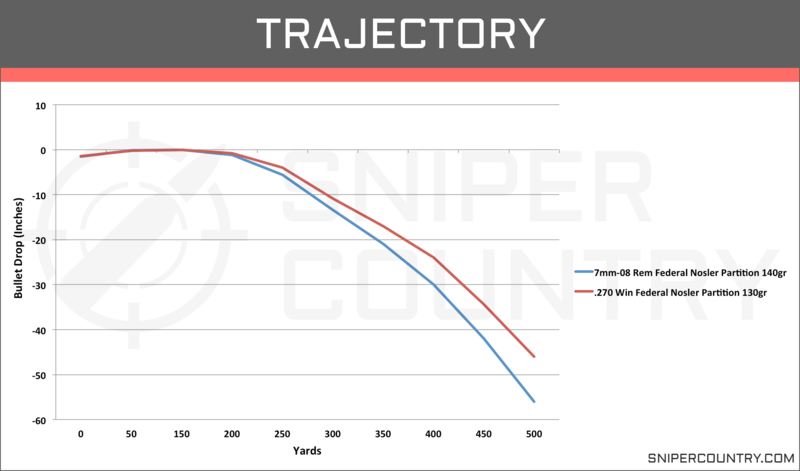 We also see that the advantage in trajectory increases for the .270 as it moves out to longer distances. Still, at 500 yards there is less than 4 inches of difference between the two cartridges and a little over 8 inches at the 700-yard mark. At these ranges, you will find that there are some 7mm-08 rounds that perform around the .270 average or a little better. At the 1,000-yard mark, we see around 26 inches less bullet drop, on average, for the .270 Win when compared to the 7mm-08 Remington. Though the .270 Win has a pretty significant advantage when looking at the averages at the 1000-yard mark, there is a lot of range for both cartridges when looking at individual rounds. One .270 Win round only has 280 inches of bullet drop at this range while another has 444 inches of bullet drop. With the 7mm-08 rounds, the top performing round only has 295 inches of bullet drop while another has 435 inches. So, while we do see a general trend for the .270 Win having a flatter trajectory at long range, there are plenty of options with both cartridges that give you a flatter trajectory just as there are rounds for both that are steeper. And for the ones that are steeper, they probably have other characteristics that make them attractive for certain applications. In this section, we will examine our ten rounds and look at the kinetic energy they carry along a flight path from the muzzle to 500 yards. We will also examine the sectional densities for each round we have selected to represent both cartridges to determine the amount of potential penetration. And finally, we will look the bullet momentum. Both of these cartridges were designed to be able to reach out at increased distances and be able to carry enough kinetic energy and punching power to kill the target on impact. This section is probably going to carry more weight for hunters rather than just competition shooters, but it’s never a bad thing to know as much about a cartridge as you can. Now, there are more factors that go into a bullets ability to drop animals cleanly, such as the bullet design and its ability to cause serious wounds based on how the bullet expands when it reaches the target. We can’t quantify this in our 7mm-08 vs .270 comparison. Because of that, we will strictly focus on energy that is accompanied with the bullet and will be transferred to the target and the amount of penetration you will get on the target. All bullets, once fired, carry kinetic energy that is generated by the force of the gunpowder being ignited and the weight of the bullet. On impact, this kinetic energy is transferred to the target where it causes damage to surrounding tissue and organs. This kinetic energy is a product of the mass of the bullet and its velocity. As a general rule, you want at a minimum of 1,000 ft.lb force when trying to take down larger game, and probably more than that when talking about bear, elk, and moose which these cartridges are often used for. We do think that the amount of energy a bullet is carrying is important to know and understand when using these rounds for hunting purposes, but we also know that those guidelines are arbitrary. Shot placement is equally if not more important than the amount of energy that the bullet is carrying. 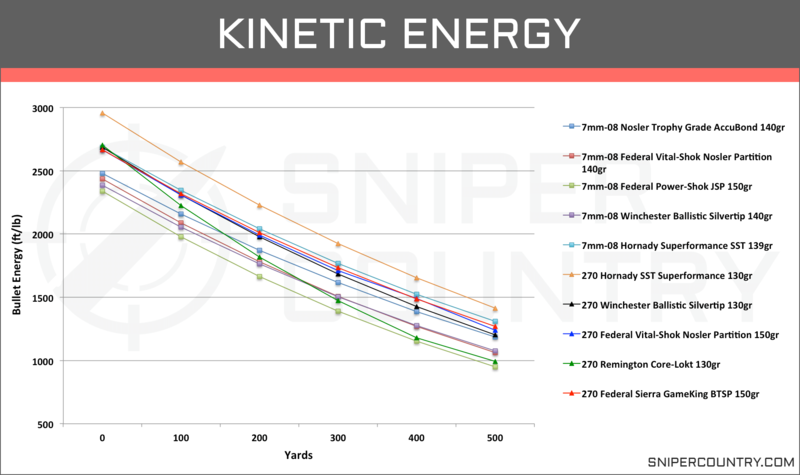 We gathered the kinetic energy data from the round’s manufacturer and graphed the numbers from the muzzle out to the 500-yard mark (Graph 7). We are not going to look at anything out beyond this range because there are very few times you will be making a 500+ yard shot with these cartridges for hunting purposes. What we see from this graph is that there is a lot of intermingling between the various rounds of each cartridge. There is no one cartridge that stands out as a more energetic cartridge. Of the top two performing rounds of these cartridges includes a .270 and 7mm-08 round. Averages give about 200 more ft.lb of energy to the .270 Win rounds out to the 300-yard mark, and that number drops closer to 100 more ft.lb at the 400 and 500-yard mark. Perhaps more important to a lot of potential users is not the difference between these two cartridges but that all of the rounds are above the 950ft.lb mark at 500 yards with all but two above the 1,000ft.lb mark. If we take it back a few hundred yards where the yardage is more common to hunting scenarios, we see that all of these rounds except one .270 and one 7mm-08 cartridge carries well over 1,500ft.lb of energy. Below, we have listed the average bullet kinetic energy for the 20 rounds of each cartridge that we compiled. With more rounds for comparison, we see almost identical trends and numbers from the smaller data set. On average, the .270 Win rounds carry more kinetic energy from the muzzle out to 500 yards. The difference is right around 200 ft.lb at the muzzle and that difference remains pretty consistent throughout the range, only falling to 117ft.lbs at the 500 yard marker. There is still some overlap between the individual rounds and you will find several 7mm-08 rounds that have KE numbers in the higher tiers with the .270 Win rounds, but you do see the .270 Win rounds have a lot more options when it comes to rounds with 2,800+ kinetic energy numbers from the muzzle. The kinetic energy is derived from the mass(x1/2) x the velocity squared. We know saw that the .270 had slightly higher velocities on average and the .270 also has more rounds in the 150gr bullet weight range which corresponds to the results we see here. The SD is derived from a calculation using the bullet’s diameter and weight. A bullet with a higher sectional density should have greater penetration than a bullet with a lower SD. To illustrate, let’s look at a quick example. We have two bullets with bullet A at 100grains with a diameter of .3″ and bullet B at 150grains with a diameter of .3″. The sectional density of bullet B will be higher and given the bullet is the same, other than the weight, it should penetrate deeper. This is because there is a greater amount of force localized to the same area, driving the bullet deeper. We can look at it another way. Bullet A has a weight of 100gr with a diameter of .3” while bullet B also has a weight of 100gr but a diameter of .4”. In this case, bullet A is going to have a higher sectional density and will penetrate further. While the weights are the same, the smaller diameter localizes this force to a smaller area with less resistance allowing the bullet to drive deeper. Momentum also goes along with sectional density, and both play a major role in how far a bullet will penetrate a target. The sectional density alone does not indicate penetration. The velocity (which is a variable in momentum) as well as the design of the bullet factor in as well. Higher velocities increase penetration as does highly bonded bullets that will not fragment on impact. 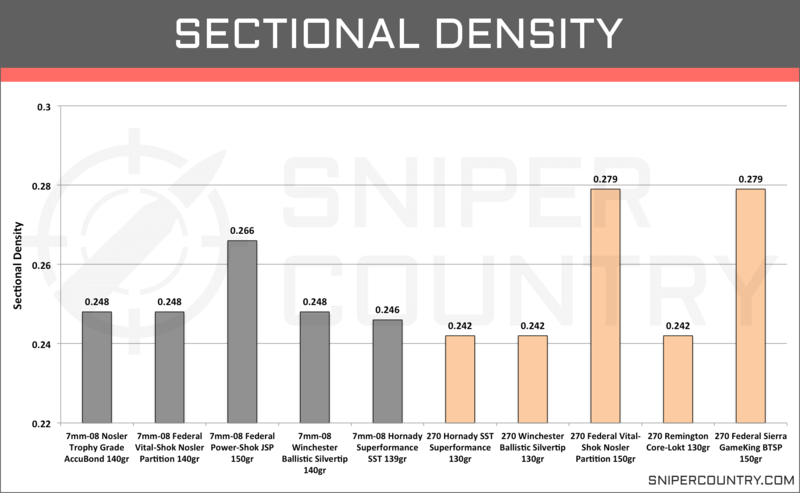 We have calculated the sectional density for each of the ten rounds used in this comparison and graphed them here (Graph 8). For the most part, all of the rounds have very similar sectional densities. The bullet diameters are only .007 inches different, and they have bullets with similar weights. All of the rounds fall between .242 and .279 regarding sectional density with two of the .270 Win rounds coming in at .279, the highest of the ten selected rounds. Both of these rounds use 150gr bullets, and with the slightly smaller diameter, they have a slight advantage over the 7mm-08’s top performing round which comes in at .266. Again, sectional density is only a part of much larger equation that goes into stopping power. While the .270 Win rounds might have the slightest advantage in sectional density over the 7mm-08 rounds when looking at their averages, we don’t think it means you should conclude that the .270 is going to be a better cartridge for killing game. Before we move on to the final category for stopping power, let’s take a quick look at the average sectional density for both the .270 Win and the 7mm-08 Remington. The average sectional density from the larger data set shows a higher SD for the .270 Win when compared to the 7mm-08 Remington. The difference is not too severe and like the earlier graph, there are 7mm-08 Rem rounds that have sectional densities around or better than the .270 Win average. Overall, we do see more .270 Win rounds with higher sectional densities and these tend to be the rounds with bullet weights in the 150gr range. With the slightly smaller diameter and increased bullet weight, they are the main reason for the increase in the .270 Win average. For the most part, you see a lot less 7mm-08 Rem rounds in the 150gr range with most of them in the 120 to 140 range. Still, they are close enough and there is enough overlap that it’s not a runaway victory for the .270 Win in this case. We will come back to the topic in the discussion section. The second metric that we will look at to gain some insight into the potential penetration of these two cartridges is by looking at the bullet momentum. Sectional density plays a role in momentum as more momentum is conserved when the projectile, a bullet in our case, is striking a smaller area. 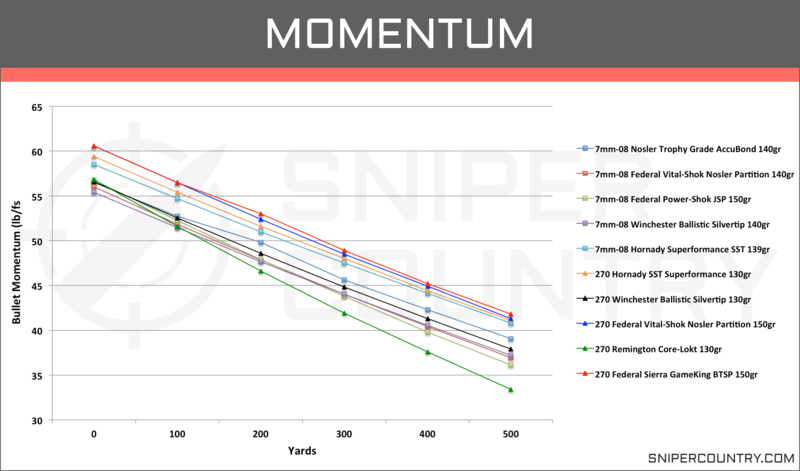 We have calculated the momentum numbers for all ten of our selected rounds from the muzzle out to 500 yards and graphed them below (Graph 9). We don’t see any clear trends between cartridges when looking at the graph which is similar to what we saw with the sectional densities. Throughout the range, rounds of both cartridge types are interspersed among each other. We are looking at two cartridges that use similar bullet weights as well as similar velocities. On average, the .270 Win rounds have around 2 lb/f.s more momentum than the 7mm-08 rounds, but there are 7mm-08 rounds that have very similar momentum to the higher performing .270 rounds and better than the .270 rounds with less momentum. Like a lot of the categories we have looked at, it’s more about the difference between rounds rather than the cartridges. From the larger data set, we see there is still not much difference between these two cartridges and their associated bullet momentum. The .270 Win carries anywhere from 1 to a little over 2 more lbs/ft.s than the 7mm-08. And if you were to look at the individual rounds, you would see that both cartridges have rounds that occupy the same range at each yard marker. The momentum is derived from the mass and the velocity of the bullets and given the slight differences between the two cartridges, this ever so small increase in momentum for the .270 Win makes sense. Accuracy is always a topic that seems to come up on any shooting forum or between friends discussing their favorite rounds. And it almost always ends up in an argument with both or multiple parties championing their round of choice. And there is almost always no data to back it up. Honestly, even when someone does show a picture of their groupings, the results can change from day to day depending on a myriad of factors. And we are not arguing that measuring MOA or inches between shots is a poor method for determining accuracy; it’s just that its tough for so many rounds and between cartridges. There are people out there we might trust, but the best way to test which round is the most accurate with your rifle is to shoot it yourself. So, how we are going to look at accuracy is to reexamine several of the ballistic and performance characteristics that we have already taken a look at. It’s a kind of roundabout way, but we can make some inferences with the previously examined data. For recoil, we do not think there is enough of a difference between these two to give an advantage in accuracy to either one. The 7mm-08 does have slightly less recoil energy, and perhaps that could be helpful if you’re shooting a lot in a single day. Overall, we don’t think either of these cartridges are going to throw off a shot. Let’s take some of the ballistic information and see if we can make any assumptions about accuracy. We did see that both the 7mm-08 and .270 Win cartridges had very similar BC’s. The averages were almost identical, and both had rounds available with BCs over .48. We also saw that the .270 rounds had around from 100-200 fps more velocity on average than the 7mm-08 rounds which might be significant for long range shooting, but again, there are 7mm-08 rounds that performed very similar to the .270 rounds. For trajectory, we saw the same trends for the short and long-range data. The .270 Win rounds tended to show a less pronounced bullet drop than the 7mm-08 rounds. At shorter ranges, the difference in the averages was pretty minuscule, but as the bullets moved out to the 500+ range, we saw the difference increase to as much as 18 inches between the two cartridges. Of course, that is just averages, and you’re not going to be shooting averages in the field. All of these rounds show less than 16 inches of bullet drop at 300 yards when zeroed at 100 yards and less than 100 inches of bullet drop at 600 yards when the rifle was zeroed at 200 yards. For factory loads, that’s a pretty flat trajectory. The best performing rounds were all .270 Win, but there were a couple 7mm-08 rounds that competed. Does any of this give the nod to either cartridge regarding accuracy? Personally, we don’t think any of it translates to one cartridge being more accurate than the other. Both have the characteristics to be deadly accurate, and it is going to depend on your rifle and your willingness to get shots in at the range. Another factor to consider when deciding on a cartridge is how easy is it to get your hands on a box of rounds. Both of these rounds are out there and can be found at most major retail stores, but you are going to run across a lot more .270 Win rounds and a lot more options. The .270 is just in higher demand currently than the 7mm-08, and that means more companies are making more of that ammo. Because there are more options when it comes to the .270 Win, you have a better selection when it comes to prices. I think it’s true for most of us that if a round has proven itself to us, we won’t mind shelling out a few more dollars. On average, a box of 20 7mm-08 rounds are going to cost a few more dollars, but the difference between the two rounds is not too drastic. We have listed the average prices of each of our ten selected rounds from several of the major retail sites and listed them in the table below. Note that the prices are subject to change. We have taken a look at a lot of information on these two cartridges. When looking at the 7mm-08 vs .270, we are looking at two rounds that can be used for a lot of the same applications including hunting as well as long-range shooting. We have included the average tables below for reference. With the long-range trajectories of these cartridges, both can be used for long-range shooting. The .270 Win rounds did show a less pronounced bullet drop on average than the 7mm-08. The top two flattest shooting rounds were from the .270 Win cartridge. For factory loads, around 100 to 120 inches of bullet drop at 700 yards is pretty impressive. Out past that mark, both of these rounds show a lot of bullet drop and are probably not the best suited for that type of shooting. At those type of ranges, hand loaded rounds are probably your best bet. Both of these cartridges had near identical ballistic coefficients and the individual rounds occupied the same range, with the best BC for both cartridges in the 0.49 range. While there is no significant difference between the two cartridges, neither of them had factory loads with a BC that is going to be wanted by experienced long-range marksmen. Another metric to consider in the context of range shooting, especially extreme distances, is how long the rounds remain in supersonic flight. Both of these cartridges had averages over 1,000 yards with the .270 Win having around 65 extra yards before falling below this mark. While the 7mm-08 had several rounds that could break the 1,200-yard mark, the .270 Win had many more options and even a few that remained supersonic out to 1,300 yards. Even so, factory loads for both of these cartridges probably limit their effectiveness to distances well below this limit. For more practical shots with factory loads, both of these cartridges provide long enough supersonic flight. All have muzzle velocities well over 2,500ft.s, and they have very manageable recoil. If you’re serious about long-distance shooting, hand loading these cartridges can give you pretty impressive results. We think going out with either a .270 Win or a 7mm-08 chambered rifle can prove fruitful. As far as hunting goes, both of these rounds have the stopping power for medium to even larger size game within range and with a well-placed shot. All of these rounds had over 1,500ft.lb of energy at two hundred yards with several still carrying over 2,000ft.lb. Energy wise, that is more than enough for most game animals in North America. And barring the bullet design, both cartridges have the sectional density and momentum to penetrate the hide and bone of medium-sized and even larger game in North America with a shot in the vitals. Both cartridges also have excellent trajectories within normal hunting ranges which help when making quick estimates on range when lining up a shot. Below we have listed the graphs for the wider selection of ammo just so you can have all the data available in this section. Before you head off, we want to take a look back at the ten rounds we spent the most time discussing in this article and just pick out a round from each cartridge that we particularly like for certain applications. This does not mean we think it the absolute best round, it’s just one that sticks out to us. There are plenty of excellent rounds for both the .270 Win and the 7mm-08 Remington that will get the job done for you. For the 7mm-08 we are impressed with the 140gr Nosler Trophy Grade AccuBond round. This is a great round for medium to large game with the AccuBond bullet providing deep penetration. It has well over 1,000ft.lb of energy at 500 yards, so you don’t have to worry about having the energy to drop game at any reasonable distance. It has an excellent BC for a hunting round at .421 and only 12 inches of bullet drop at 300 yards when zeroed in at 100 yards. The Federal Vital-Shok Nosler Partition 150gr is one of our favorite hunting rounds for the .270 cartridge. This round has nearly 2,000ft.s velocity at 500 yards which is more than enough to get the correct terminal ballistics. That paired with bullet energy greater than 1,500ft.lbs at 400 yards give this round excellent stopping power. We also like the heavier grain bullet that can get penetration on larger game. The long range trajectory for this round is not as flat as other .270 rounds but it is still manageable at 400 yards and to be honest, any range after that we are not concerned with when it comes to hunting. For competition shooting, you are most likely going to turn to hand loaded rounds, but for the five factory loads we have looked at, we would go with the 139gr Hornady Superformance SST round. It’s an affordable 7mm-08 round that has tremendous velocity and a high BC of .486. This round also has an extremely flat trajectory for a factory load with only 39 inches of bullet drop at 500 yards and 105 inches at 700 yards. With 18ft.lb or recoil energy, you can shoot all day with some gun support at the range without getting fatigued. Our top range round for the .270 is the 130gr Winchester SST Superperformance. This round excels in the velocity category with over 2,200ft.sec at 500 yards and will remain supersonic for several hundred yards beyond that mark. The BC of this round might not be as high as long-range shooters would like to see, but the flat trajectory might compensate for this with a bullet drop of only 33 inches at 500 yards. That’s pretty impressive for a factory load. This round is a bit more expensive compared to the other .270 factory loads that we have looked at, but it gives you the best long-range performance. From the data we have looked at in the 7mm-08 vs .270 comparison, we feel pretty confident in stating that these cartridges can do what they were designed for. Both of these cartridges can be used for the same shooting applications and we think that whichever you go with, maybe even both, you are going to be happy with your choice. More than anything, it’s important that you become confident with your chosen cartridge. Whether it’s the 7mm-08 or the .270, with some time on the range and the right round, you’re going to get the performance you want. In the beginning of the article when comparing bullet and cartridge dimensions, you said the 7mm-08 bullet is 7 one-hundredths of an inch wider in diameter. The 7mm bullets are 7 THOUSANDTHS of an inch wider than .277 inch bullets. Not trying to be mean. Liked the article, just noting a typo. Thanks a lot for your comment Neal. We very much appreciate feedback like this and just fixed the error you found. Thanks again! Excellent article. Saves me a bunch of time and money. Very well done. Thank you. Thank you for a thorough and insightful article. I have always loved my 700 Rem in .270 cal, but have become curious about the 7mm-08 mainly because of the shorter action required. From a practical standpoint, there is no justification for me to acquire a new rifle in 7mm-08, since it is ballistically so close to the .270. However, something is compelling me to find that perfect 7-08, and open my wallet. Your article helped sell me on it. Thanks! Now just to decide which model/brand rifle to get. Really good read, I did not realize just how close these two rounds actually are.